Pedagogues of the Ukrainian Secondary School. Sitting left is Ivan Kobyzs’kyi (director in 1930–1933), in the middle Yakym Yarema (director in 1925–1928). 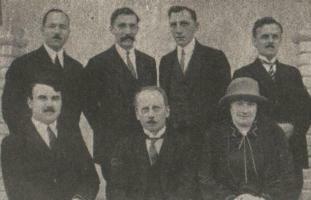 The second from left stands Marko Khlyur, the head between 1933–1936. The Ukrainian Secondary School was founded in Prague in March 1925 as a direct branch of the Ukrainian Pedagogical Institute of Mykhail Drahomanov. Its predecessor was the School of Ukrainian Plastuns in Szczypiorna at Kalish in Poland where a group of students came from. The secondary school also sourced from activities of the Ukrainian leaving-exam courses held in Josefov by Jaroměř, Poděbrady and Prague. Originally, the school was supposed to help students of the institute to get practical experiences. However, in 1927 the secondary school must have been moved toŘevnice due to financial reasons. Links with the institute started to weaken. The school became independent in 1932 and moved to Modřany (nowadays a part of Prague) five years later. Here it also survived the war years. Thank to the director Avhustyn Shtefan, the school was not involved in cooperation with the occupants. Most of its students and teachers were evacuated into Augsburg in Germany where they continued their studies. Two years later, it was divided into three new schools. After 1956, only the secondary schools in Mittenwald in Germany. The first director was Yakim Yarema (1925–1928), who was succeeded by Agenor Artymovych (1928–1930) and Ivan Kobyzs’kyi (1930–1933). Between 1933–1936, the position of a director was vacant and the school was led by the deputy-director Marko Khlyur. Director Hryhorii Omel’chenko (1936–1940) was succeeded by Avhustyn Shtefan (1940–1945). There were 69 teachers at the school altogether and 700 graduates. The collection contains archival materials from two periods: from years 1925–1931 and 1941–1945. The most important information can be found in protocols from meetings, briefings and conferences of the faculty staff at the Ukrainian Secondary School describing daily life at the school as well as important events from 1927–1930 (inv. No. 125). Personal data of applicants for study and job from years 1928–1931 and 1943–1945 are another important source (inv. No. 46–55). It provides information about social situation of those people as well as precious information about the situation of Ukrainian emigrants in Central Europe at the end of the Second World War. In the file “Personal – lectors, employees” (inv. No. 2–43), we can find information about teachers, incl. their biographies. The file “General Documents” (inv. No. 1) contains, amongst others, the plan of establishing the secondary school from February 1925. Financial matters (e.g. budget drafts, meal coupons etc.) can be found in the file “Accounting” (inv. No. 57–66). As for correspondence, we cannot forget the communication between the school and the Czechoslovakian Ministry of Education (inv. No. 79–108), with school’s inspector Professor František Lakomý (inv. No. 78 and 106) and with the Ukrainian Pedagogical Institute. (inv. No. 94 and 121). The collection is not only an important source about history of the Ukrainian Secondary School but also about the situation of Ukrainian emigration in Central Europe in the year of 1944. Archival materials dealing with activities of the Ukrainian Secondary School can be found also in the Prague City Archives (collection “Community Reformist Ukrainian Secondary School in Modřany”), in the National Archives in cartons MŠ 1341, MŠ 1342, MŠ 1387 and UM 9 and in the Archive of Charles University (in so-called All-Student Archive).